There are several reasons why you might have a leak. A common issue is a leak at a miter joint. 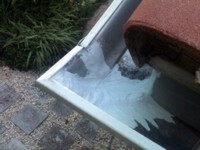 This can happen because the gutter is improperly pitched so that water sits and deteriorates the sealant. We will assess the problem and likely reseal the miter joint. The process requires removal any debris by cleaing the gutter, removal of the deteriorated sealant, dry and scrape and loose material away and re-caulk the miter joint. We do not use any silicon based material, our 20 year history has taught us a few lessons and this was one of them. Using a much higher grade acrylic caulk that (is more costly for us) makes you the customer much happier in the long run. Why are the nails pulling out of the gutter? The cause of this can be a gutter that is to "heavy" with debris and the nails have pulled away from the fascia. Also the wood fascia may have become rotten and pulled loose. If the fascia is in good condition we would recommend cleaning the gutter, checking the pitch and replace the fasteners with a ring shank spike and ferrule. Why are there stains on the outside of my gutters? 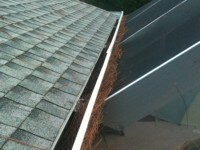 This is a common occurrence, and is caused from water running over the front of the gutter. These are referred to as "tiger stripes" and can be very tough to remove. Harsh chemicals are not recommended because they can damage vegetation below and around the gutter. We do not offer services at this time for this issue. We often refer the customer either a pressure cleaner or using a specialized cleaning product. My Screen Enclosure has leaves on it, will you clean it? Yes, we will clean of the debris that is accessable from the roof line. Debris in the field or middle that can not be reached from the roof line we can not remove. Pine needle are especially difficult to remove because the needle fits perfectly in the opening of the screen. Sometimes a pressure cleaner is able to blow off the debris, just becareful that they do not use to much pressure because it could blow the screen off. Should I use Gutter Covers? Probably not. 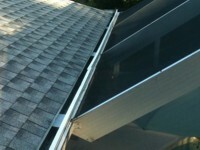 Gutter covers can be costly and should work. But in our experience, the gutter still needs to be cleaned. 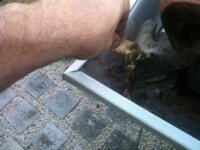 Large leves and debris are kept from the gutter but the small debris still settles in the gutter. Once it gets in, it will start to accumulate and block the gutter water flow. Granules from the composite roof, seeds, or roof tile breakdown, build up in the gutters so eventually you have to clean them out anyway. For the cost of gutter covers, an annual or semi-annual gutter cleaning and maintance is likely more cost effective.